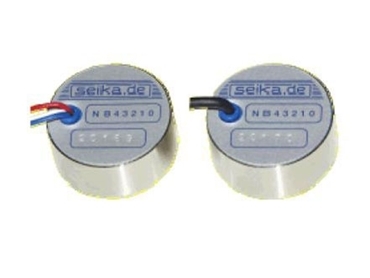 Seika B1, B2 and B3 from Control Devices (Aust) are accelerometers of high overload resistance with integrated electronics for measurement of acceleration in the frequency range 0 to several 100 Hz. The sensors B1, B2 and B3 are capacitive spring-mass accelerometers with resonant peaks minimised by special gas-dynamic damping in the primary transformer. The sensors are manufactured with an analogue DC output. Requiring only low amounts of power, the sensors are in conjunction with the capacitive primary transformer characterised by low error and high long-term stability. The B1, B2 and B3 accelerometers are ideal for applications requiring high overload tolerance, high long-term stability, small lower cut-off frequency down to measurement of static acceleration, very short on-transition delay and low power consumption. Typical applications include measurements on vehicles, machinery, buildings and plants for process control and error diagnosis, seismic measurements, inclination measurements, safety engineering and dynamic measurement of position and velocity.